Former Zambian President(Super KK) from UKZAMBIANS on Vimeo. 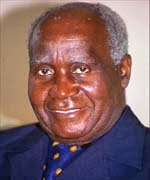 Former Zambian President Kenneth Kaunda was a guest at Rhema Church in Croydon London on Sunday 28th June 2009. He was invited by Pastor Martin and Sandy Phelps the Founders & Senior Pastors of the Church.